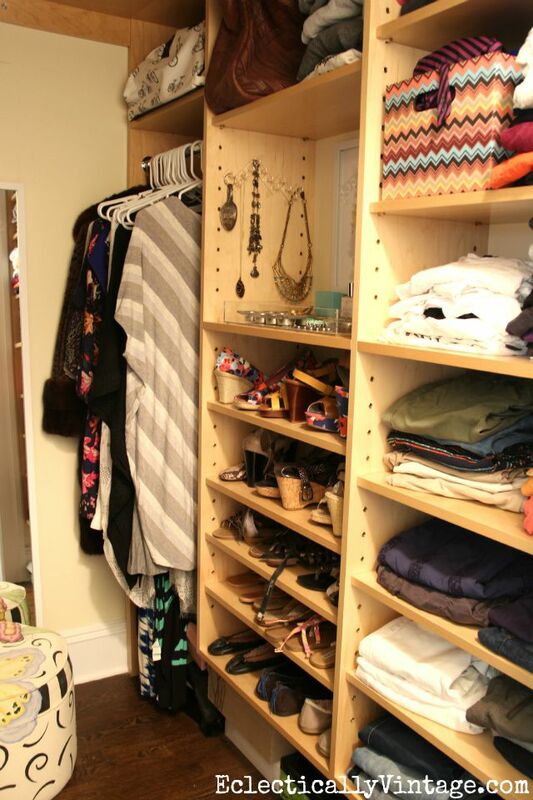 When we renovated our house, I was horrified when I looked at the architectural drawings and discovered that my closet was the same size as my husbands. Obviously, the architect is a man who doesn’t understand my love of retail therapy so I made sure he made my closet much larger than my hubby’s (sorry dear). 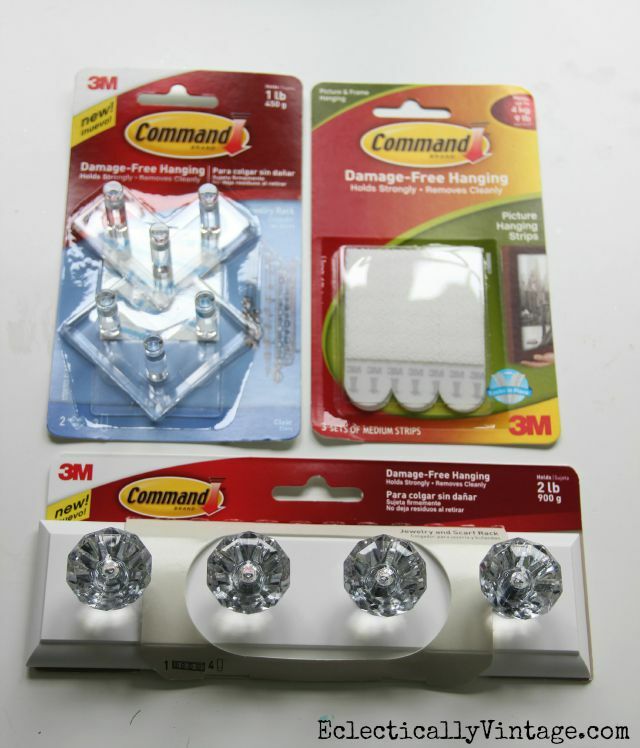 I’ve decided closets aren’t just for clothes and thought it would be fun to create a jewelry station with a little help from Command™ Brand. 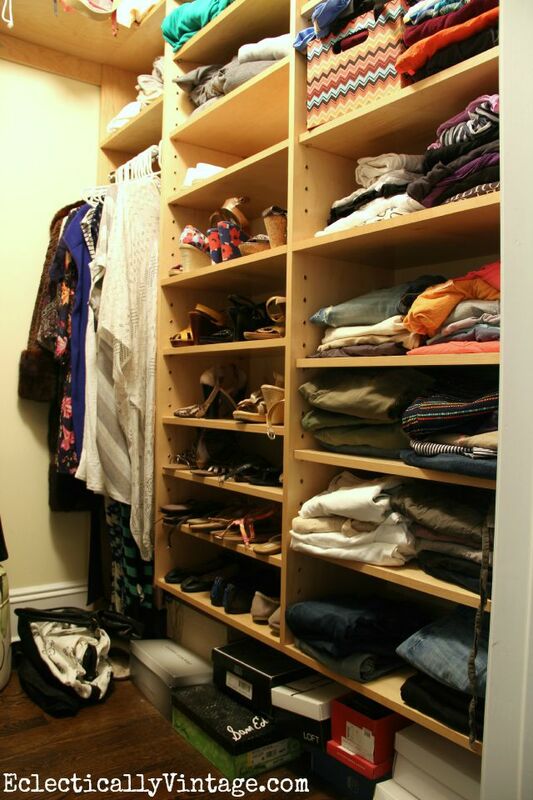 1) Clear off a shelf in your closet and follow all surface prep instructions on the back of the packaging to clean the walls. 2) Add some personality to by hanging a favorite piece of art. Following package instructions, mount the frame to the back wall using Command™ Picture Hanging Strips. 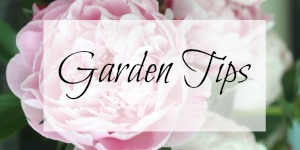 Be sure to reference the packaging to determine how many strips are necessary based on the weight of the frame. 3) Plan the layout for your Command™ Jewelry Racks by arranging them on the shelf until you come up with your favorite design. Then, follow package instructions to adhere the racks to the side wall. I thought it would be fun to use a zig-zag pattern but the possibilities are endless and I love that they are clear with clear adhesive so they blend into any background. Tip: Be sure to adhere the adhesive strips to the racks so that the tabs are easily accessible and aren’t covered by the next rack. 4) Following package instructions, mount one Command™ Jewelry and Scarf Rack to the opposite side wall. 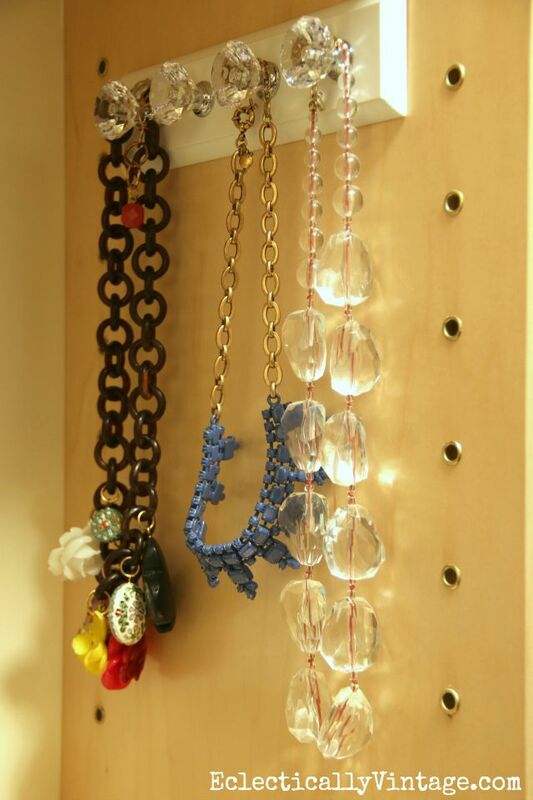 5) Hang your favorite necklaces, bracelets, rings and other accessories from the racks to easily organize and display your bling. 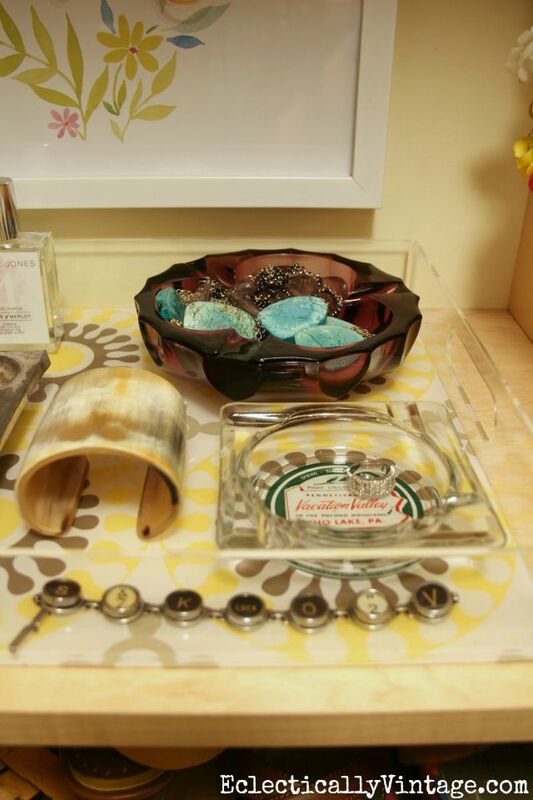 6) Add a tray on the shelf to corral more jewelry like earrings and watches and display them in cute little containers like my vintage ashtrays and mini muffin tin. What happened to the shoes? I like storing sandals and flats in cute baskets so I took some off the shelves. I love having my jewelry laid out like this. I forgot I even owned some of these pieces when they were hidden away in a drawer. I am a Command™ Brand Ambassador and truly love the company and their products. I only speak the truth. I love the Command products and I’m so excited to see these things! I feel a jewelry center in my closet coming on soon! 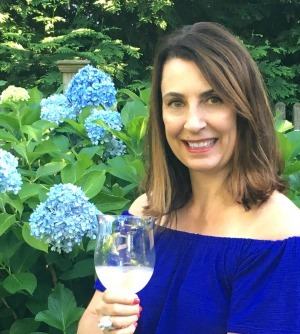 Thanks Stacey – I actually wear more of my jewelry now that it’s right in front of me every day! I LOVE these new items!….I have the very large clear command hooks in my closet to hang things…Now I need to reorganized and get those fabulous jewelry hooks and those knobs are fantastic….Love the jewelry station that you created!!! 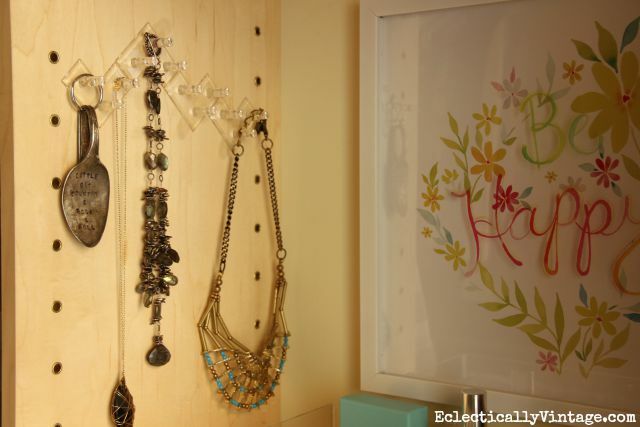 I love Command hooks and use them everywhere! 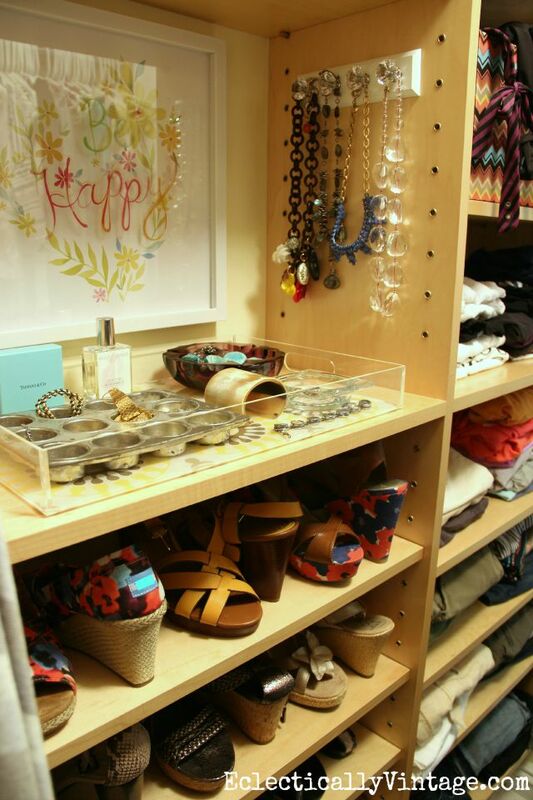 Great jewelry organization! Nothing beats being able to actually see what you have and what you want to wear. Have a great weekend! i didn’t know they had these “Jewelry” organizers! i use Command brand all over the house! great idea. 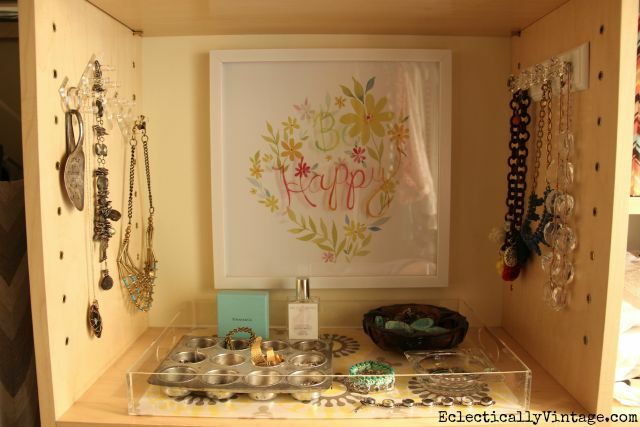 Hey Kelly, Love your jewelry station and all the Command products – use them all over my house. I think, instead of the pretty art work, I would use a mirror, so I could see just how pretty the jewelry looks with my chosen outfit! Just sayin’! Thanks Pat! I have a full length mirror on the other wall – great minds!